On both Saturday and Tuesday, I trekked up the coast. The primary rounds were on regulation courses, but I squeezed in a handful of short courses on each day. 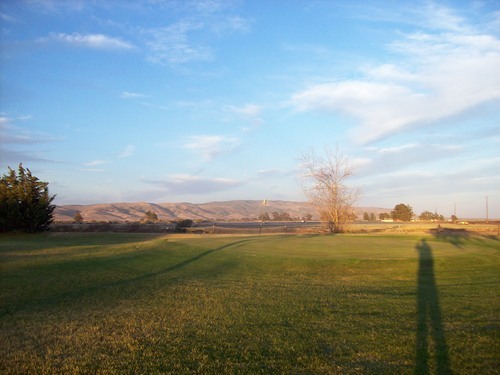 Before meeting up with my friend for an 8:00 tee time at Rancho Maria on Saturday, I decided to try and squeeze in an early morning round here at Sunset Ridge. I definitely didn’t waste any time as I showed up before dawn and went off by myself at first light. The price was $12 for 10 holes. That’s right, this is a 10-hole course (maybe 11). The highlight hole is the second, which is just 86 yards long, but plays to a small island green. It’s actually a pretty fun and intimidating little hole, especially for beginners. There is an “extra” hole by the 6th green and 7th tee box. I’m not sure if it’s just a short game practice hole or if it was taken out of the regular routing at some point. There was a hole cut and flag in. 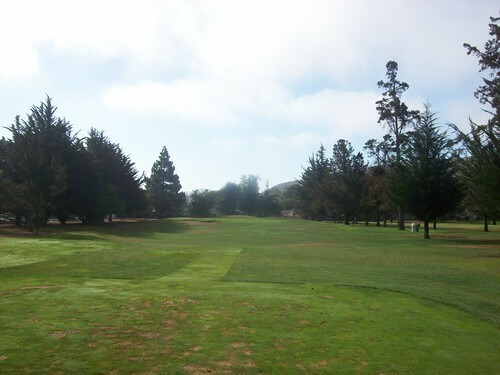 I had heard this was a 10-hole course, but any scorecards I found online reflected only 9 holes, so I thought maybe this was just the bonus hole and I played it real quick just to say I did. However, it turned out there were still 10 other normal holes and the actual scorecard had them all listed. This 11th hole is just kind of a mystery I guess. 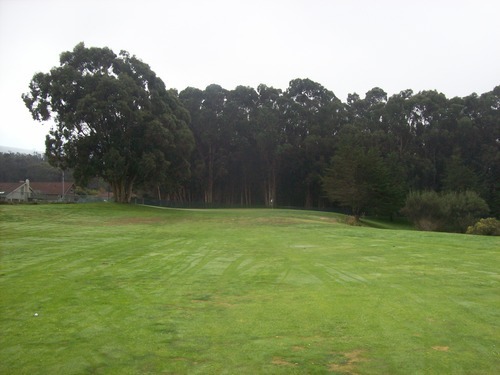 Conditions were fine for a low-end par-3 course. The tee boxes and greens were decent and that’s what matters most. It wasn’t anything too great or inspiring, but good enough for playability. 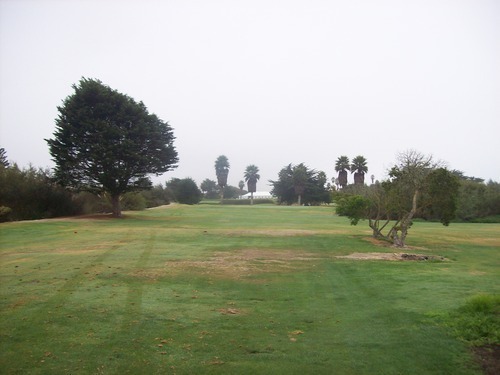 Obviously, the Challenge Course at Monarch Dunes is your best bet for a par-3 course in this area. 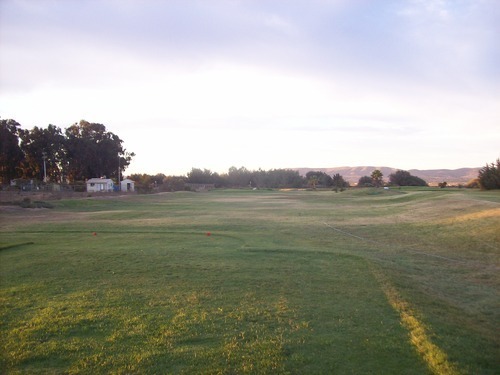 I love that one, but Sunset Ridge is decent as a cheap and convenient option for a practice round or beginner play. 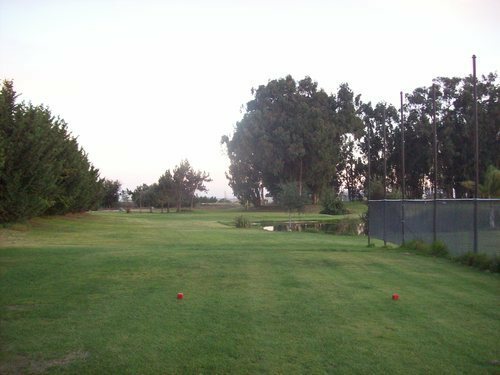 They do have a big driving range here, but the nets are completely torn up, so if the range is busy, keep your head on a swivel while on the course (especially hole #3 right behind the end of the range where there are no more nets left at all)! 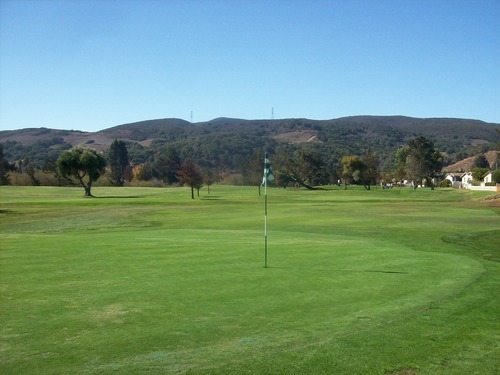 A friend and I drove up together to get in some early short course rounds before Tuesday afternoon’s SCGA outing at San Luis Obispo Country Club. 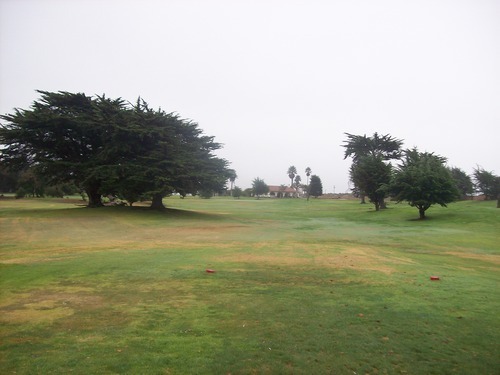 We made three stops in the morning and Pismo State Beach GC was the first. We got there a little after 7:00 and the place was empty other than the guy working there. Some more people started to show up and play after us, but we were the first ones off and had the course to ourselves. The price was $12 to walk the nine holes. 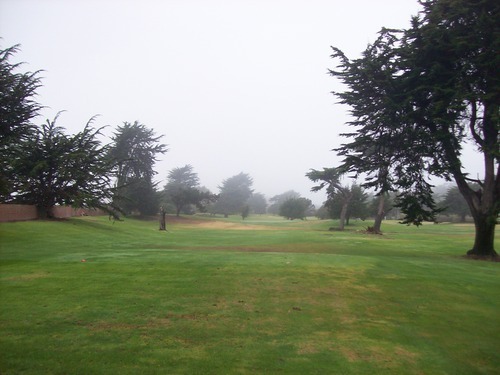 Pismo is just a par-3-only course. Probably its biggest selling point is that it is right near the beachfront. 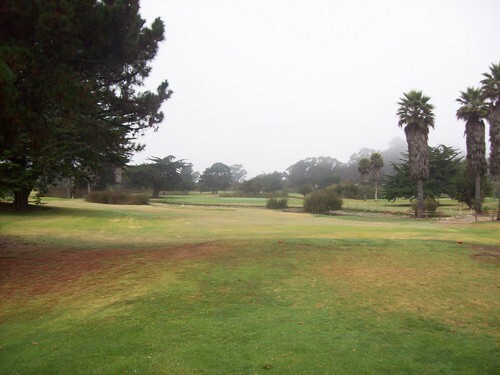 When you look at the satellite view of the course, you might think it’s a hidden gem with some nice ocean views. It was really foggy on Tuesday, but even when clear I’m not sure it offers any significant views. 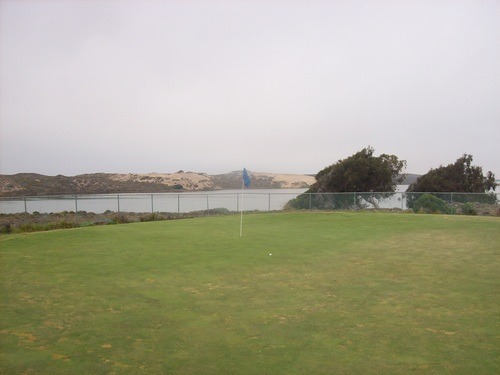 There is a big brick wall on the edge of the course closest to the beach and then some big sand dunes in between the course and the water, so it’s pretty obscured. 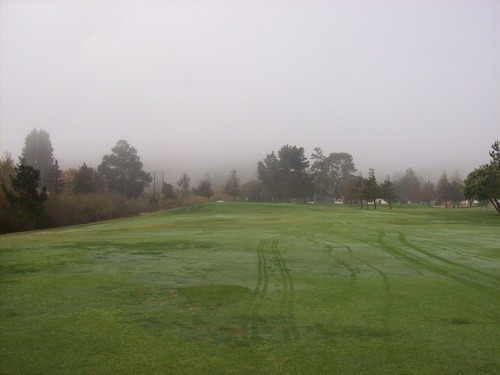 The course itself is flat as a pancake, so there are no elevated points either. 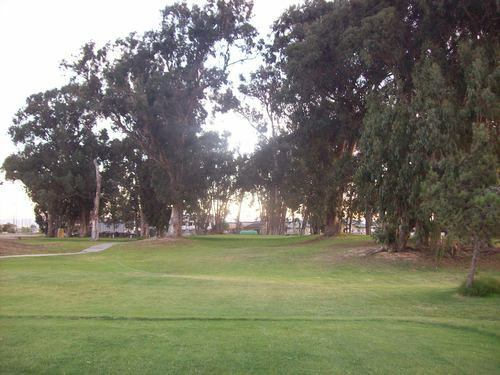 The other side of the course is bordered by a mobile home park, so yeah, the scenery isn’t as dramatic and one would hope. 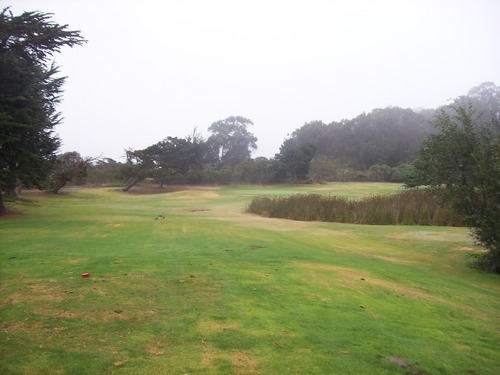 This is a fine little par-3 course with holes ranging from 110 yards up to 220. A few holes have separate tees for front and back nine play. 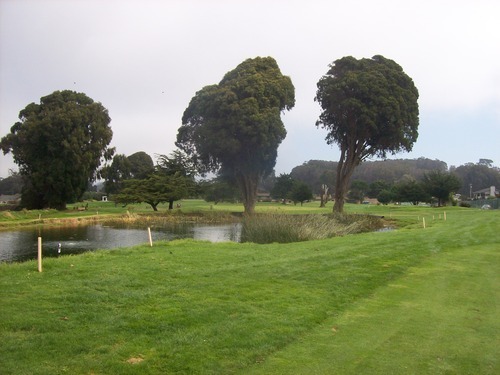 There are a few water hazards in play that are teeming with egrets and other water fowl, there and some nice cypress trees dotting the landscape to give you a little of that Central Coast/Monterey kind of feel. Most holes are pretty basic, but the variety of lengths make it a decent course to use a few different clubs and work on the short game. Of course, it’s also a great layout for beginners. The conditions were not too great, but decent enough. A few of the greens were pretty chewed up and that was unfortunate, but the other significant parts of the course were maintained well enough for a track of this caliber and price range. It is certainly not the hidden gem I was secretly hoping for and there’s a reason you’ve probably never heard of it, but it’s there and it serves its purpose for the crowd it is designed to attract. I wasn’t really expecting too much from this course, but I have to say it was a relatively pleasant surprise. I didn’t think there would be too much of a crowd to contend with on a Tuesday morning, but there were some folks out there. I think my friend and I were the only ones there under 65. I’m not sure if that’s always the case at Laguna Lake or if they have special senior rates on certain days and/or times. Still, it really wasn’t that crowded out there. The nice old lady working the counter gave us a little bit of a lecture for not booking a tee time, but there was still no problem in getting us out right away. The price was $11 to walk. We started off behind a fivesome, but they let us play through. We had a few open holes before catching a group of ladies. The last few holes took a little longer, but we made it through at a decent pace. 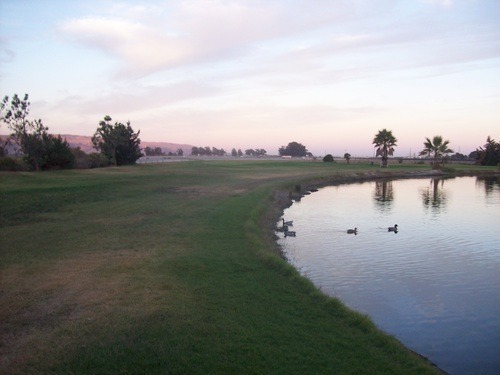 Like Sunset Ridge, Laguna Lake is also a 10-hole course. I knew that about Sunset Ridge going in, but wasn’t aware that was the case here, too. I’m not sure how that came to be, but it is what it is and you might as well enjoy one extra “bonus” hole! The course starts with two very short par-4s. The 1st is 244 yards and very wide open, though the blues were playing up even further and probably only about 220. The 2nd is just 201 from the blue tees. Either hole would probably be a par-3 on most regulation courses, but we had fun going for the greens (unsuccessfully, I might add). Beyond those opening holes, the rest of the course is a decent mix of par-3s at varying distances ranging from 89 to 144 yards. Probably the highlight hole is the short 7th over a little ravine. It’s a fun, but touchy shot to find and hold the small green as you try and fire at the pin. 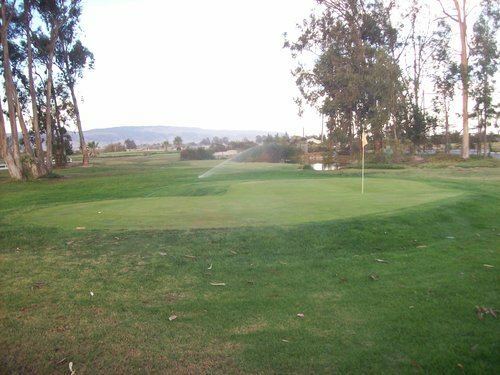 Though still far from great, Laguna Lake was probably the best conditioned of the short courses we played on this day. The greens were mostly pretty good and the two par-4s had fairly decent fairways. Everything else is a bit of a hodge podge, so you get whatever you get if you are off-target on the par-3s. This is probably a course that’s best left for the seniors, kids and beginners, but as a cheap warm-up or practice option for a more experienced player, you could do much worse. 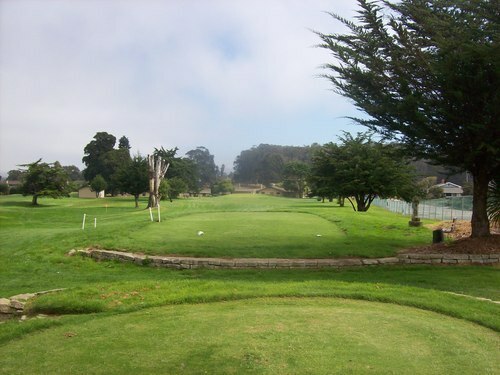 I’ve always heard pretty good things about this course, but never had the chance to play it. It’s always been just far enough out of the way that I kept passing it over. They had a tournament in the morning, which is why we saved it for our third round. I booked an 11:15 time through GolfNow for $11 (walking) and that is a reasonable rate for this course. The tournament was clearing out when we arrived, but we had the entire course to ourselves once we teed off. 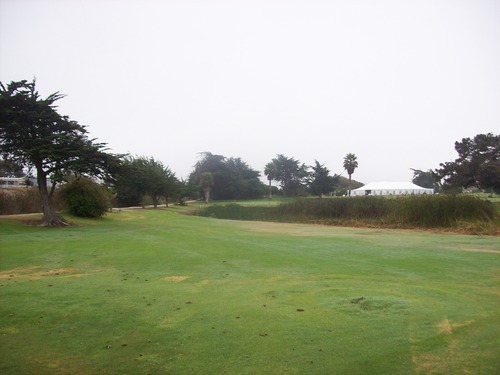 Sea Pines is a cool little resort just south of Morro Bay. 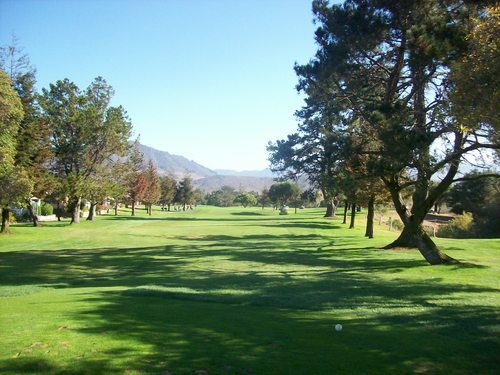 They have some lodging and other activities to partake in, along with the 9-hole par-31 golf course. 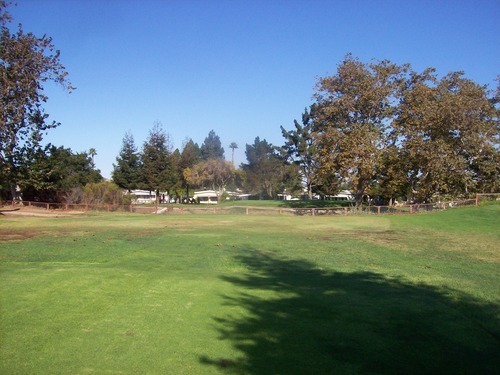 The regular golf course also doubles (and triples) as a foot golf course and a disc golf course, so whatever form of the game you prefer it is set up for you. 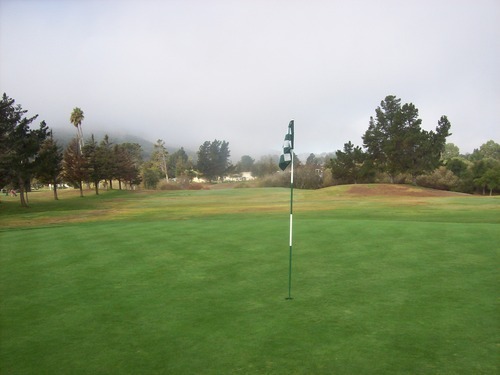 Most holes have the big foot golf hole and the disc golf basket just off to the sides of the regular greens. There are only a few variations along the way. We were there for regular golf, so that’s what I’m concerned with. 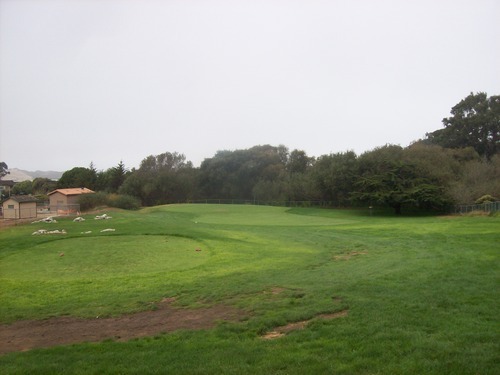 The course starts with two par-3s, then four par-4s in a row, and then three more par-3s to finish things up. The first hole is a little weird and out of place right next to the pro shop. From there you cross the street to play the other eight holes. I wonder if they changed the routing at some point, losing a hole on the other side and shoehorning what is now the 1st hole in where they could. Whatever the reason, it doesn’t quite fit in with the rest of the course. 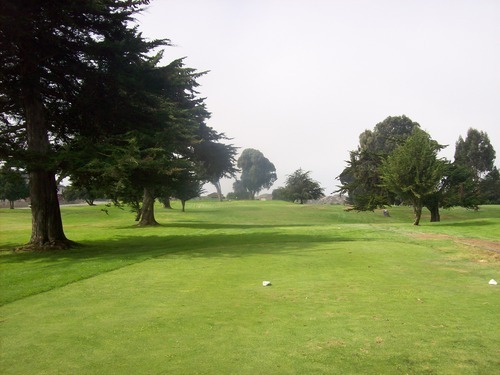 Easily the best—and toughest—hole is the par-4 3rd, which is relatively long at 361 yards and the second shot is all carry over a large water hazard. There doesn’t appear to be too much room behind the green either, so it is a knee-knocker. 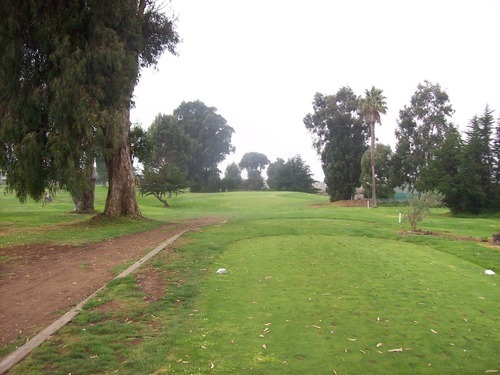 The 6th hole is one of the weirdest I’ve encountered and needs to be played a few times to find the proper strategy for yourself. A sign by the tee box says to lay up 145 in front of the water. I did that, but there was still a ton of fairway beyond that and up to the right. 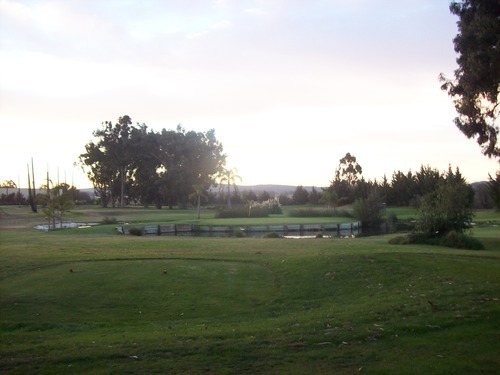 On the other side of the pond to the left, sits the green guarded by two tall eucalyptus trees. I think you really need to be about 170 up the right side of the fairway to have any sort of angle between the trees to the pin. If you are not perfectly positioned, it will be an awkward second shot. I can’t say I was a fan of this hole as a first-time player. The conditions were a little mediocre. The rough was nice and lush. It was easily the best part of the course. 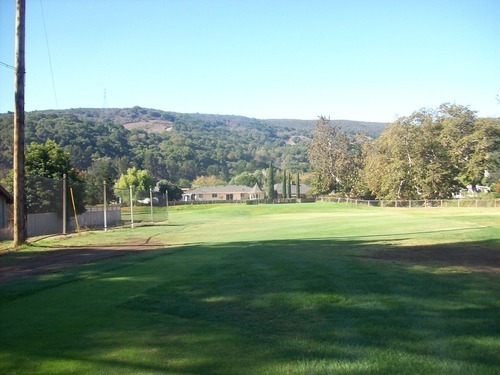 The fairways had a lot of chewed up areas. Some, like the 4th and 5th were really ugly. Others were pretty good. The greens started off pretty decent and seemed to get worse with each passing hole. The last few were really beat up and burnt out. 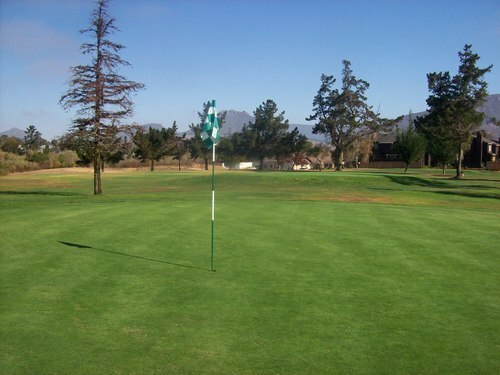 Though some fairways and greens had their issues, the cuts were well maintained to highlight the contours of this course. If it were in really nice shape, it would be a very nice looking design with a good visual presentation. It’s just a bit too beat up right now, but still plenty playable. 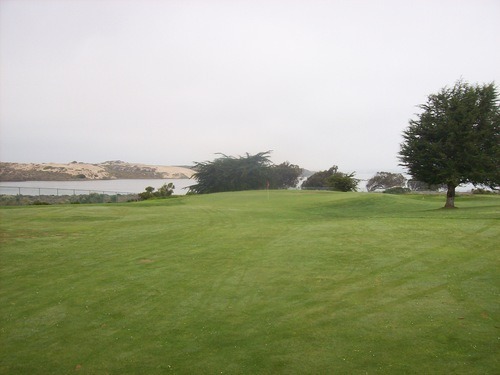 The stretch of 4-6 offers the best scenery as the course sits south of Morro Bay and is bordered by some sand dunes and water. It was pretty overcast while we were there, so it wasn’t looking as nice as it could. 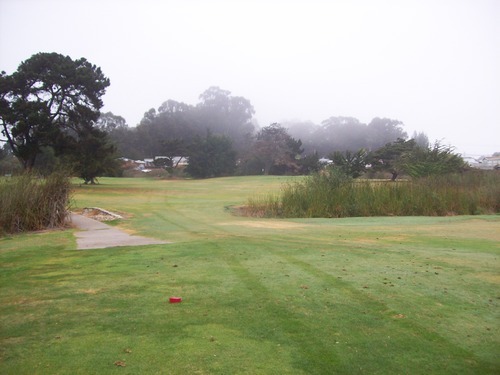 If you are in the area, Sea Pines is definitely a fun one to play. I don’t know how much it costs to stay at the resort, but for the regular golf rates they offer it’s a solid deal. It’s definitely a couple notches above the standard “short course” and if you do catch it in really good shape, it will be a nice treat.